A man and his farm and a wacky invention. It’s a farm with no chickens or cows or pink pigs. Instead you’ll find lots of odd thig-a-ma-jigs. And wings from an airplane that’s been there for years. Strung out kind of scraggly by a bunch of old tires. It’s all rather messy and unkempt and uncouth. Like ten tons of trash to tell you the truth! Who boasts an ambitious, magnificent plan. Has designed a machine to make wind, snow and rain! That’s what Doc claims his invention is worth! His last three inventions hadn’t worked well at all. That shine in the day but won’t glow when it’s dark. That stops for five minutes at least twice an house. The town’s Winter snowplow only runs in reverse! Dr. McMasters and the machine were both there. While around and around the TV crews dashed. Who stepped to the front to deliver his talk. About his machine and its relevant theories. Asked a reporter with a half smiley smirk! Asked what it is his invention would do. “Will it make the rain fall when it’s too hot and dry? “And what about thunder and lightning and such? “And by noon I’ll be ready, it’ll be fully tweaked. Doc came to work and he worked like the dickens. And other small doodles between and betwixt. And gave ‘em a whirl to test for small glitches. And made one final search for unseen mistakes. He completed his tasks not a moment too soon. Time had been flying— it was already noon! Then preachers and teachers and kids with their mothers. Who drove down to see Doc’s new weather maker. Came down to be part of this hullabaloo. How many had come?— there was no way of knowing. But one thing’s for certain, the place was a mess! Most of the town had come down there I guess. 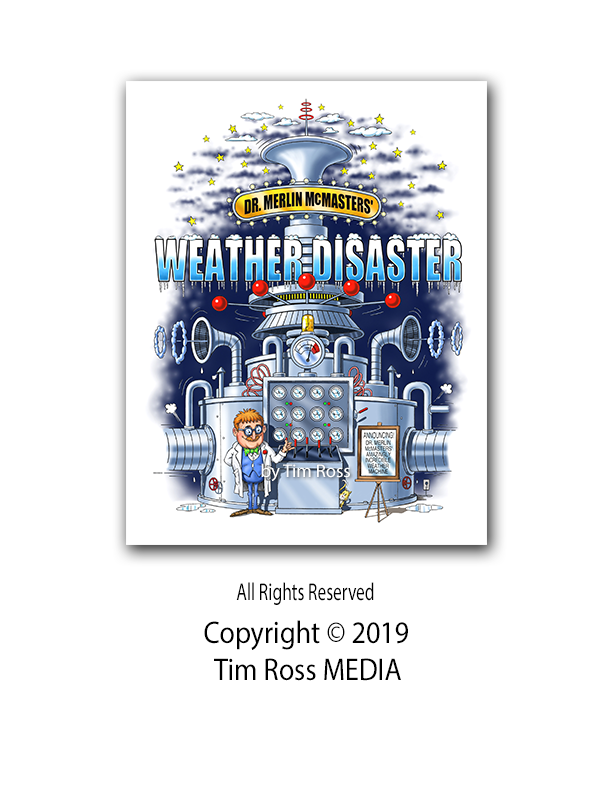 The day they unveiled Doc’s weather machine? It was such a cold day with gusty north breezes. You could hear a few coughs and one or two sneezes. Folks clustered together for gossip and talking. “It’s not going to work! There’s really no way! As they gathered all ‘round the weather machine. We’re all standing here by Doc’s new invention. Of Dr. McMasters,” he said to the crowd. “This is truly a moment that we all will remember. Then proudly proclaimed his worthy intentions. So I’ll tell you precisely what it is I will do. Which sent a few sparks straight up from a tower. Caused most of the folks in the crowd to jump-jump! Dr. McMasters was alarmed, you could tell! His contraption, it seemed, was working too well! The pipes from the boiler were all blowing steam. The gauges read, “DANGER” and whistled and screamed! Buzzers blared loudly and alarm lights were flashing! So away from this place the people went dashing! This really was nothing— and you’ll see what I mean. Burst back through the pipes to Main Street & Green. ‘Cause the water’d backed-up and just couldn’t stop. Since the city’s park fountain shot up like Old Faithful. From storm drains and sewers the torrents came rushing. While faucets and toilets in homes were now gushing! Thousands of gallons of water went sloshing. In all parts of town pipes began bursting. But as bad as that was it wasn’t the worst thing! Flooding’s not good on a cold day in December. The results will be icy and slippery, of course. It’s bound to add up to some awfully bad weather! And freeze-up it did— and it froze really quick. In a matter of minutes the whole town was too slick. There was ice on the roofs. There was ice on the roads. There was even some ice in townsfolk’s commodes. Was frozen in place with the ice in an arc. Quickly proclaimed, “I’ll be glad to see summer! But he did find a torch and that did the trick. But when it got warmer, it got warmer fast. The ice melted quickly— so imagine the mess. Do I need to explain?— I think you can guess. These folks love their town, and they never gave up. And they cleaned-up the oosh, the schlosh and the schlup. They repaired all the damage in each home and store. In a matter of weeks it was just like before. And began that grand day with his own friendly greeting. I’m awfully darn proud of the work that you did. In fact, say the records, the worst that we’ve had! But we are near the end and we’ll make it I’ll bet. And surprisingly, Doc, the mayor defended. Had gathered ‘round Doc and Mayor Mick “V”. And the mayor’s quick answer did come as a shock! “Doc has insurance, the bills will be paid. So I think we’ll excuse the mess that he made. And we’re all mighty proud in our town he is living. And one thing I’ll add, while we’re all here together.